Prom has become yet another financial event in a kid’s life that must be taken in account when creating your spending budget because all of you parents out there are dropping a bomb. Well intentioned as it may be. There’s the professionally done hair and makeup, group spa dates, bespoke suits, Bentley car rental and hotel suites for the night just to name a few things. I’ve even heard of kids gifting their date with jewellery. Please don’t feel like you have to match what some parents are spending on prom. Their financial goals are not going to be the same as yours. If you haven’t made a budget and planned for the expense, start now and involve your child. It’s a great time to teach them about budgeting and money management if you haven’t already. If you don’t know how to budget come in and see us. Prom is something that every teen should get to enjoy, to celebrate their hard work and success but it doesn’t have to be a financial burden for parents. A financial red flag is not having money available for planned events like prom. If you find yourself putting any of this expense on your credit card or line of credit then it’s time to seek financial help. And know that you don’t have to be in debt to get financial coaching. Having consumer debt is not the only sign of financial difficulty. Do you have short, intermediate or long term financial goals? Do you know what’s coming in and going out every month? 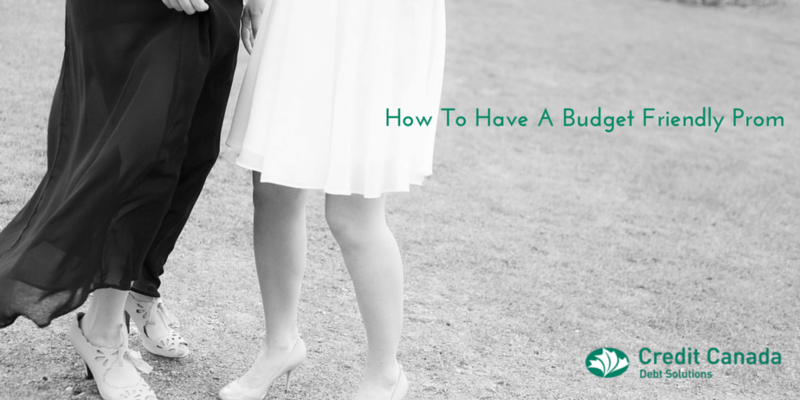 Do you have a budget that you stick to and revisit at least once every year? Do you have an emergency fund and retirement savings? If you answered no to any of these questions you can call Credit Canada for help. Now, back to prom. There are endless ways to get your kid to prom looking and feeling their best without cashing in their RESP. Online is the way to go to stretch your dollar. A great online store is ASOS. There you will find hundreds of fashionable dresses and suits for any shape, size and budget that your kids will love. Lots of the dresses are under $100. As for accessories, you can check out Forever 21. When it comes to hair and makeup there are endless tutorials online. I can’t help you out on the Bentley and as for the hotel suites, just don’t! If you know any teens who may not be able to afford what they need for prom, there are many great organizations out there who can help. An example is ‘Inside the Dream’. Google them for more information. You can also make a donation to many of the organizations including Inside the Dream. I would LOVE to hear your prom stories both retro and recent. Also if you have tips and suggestions for cutting the cost please let us know in the comments.